As mentioned in the relevant preview the NOVOFLEX® name is well known internationally in the photographic support equipment industry. A synonym for novelty and versatility and above all precision and quality according to the indisputable German standards. Nevertheless, German quality is also accompanied by a premium price, which is another attribute of the Novoflex products. But the Novoflex VR-System Slim, besides its innovation and economy in size, is somehow more affordable than previous Novoflex® VR solutions. A fact that will make the fans of German quality quite happy. A close encounter with the head gave me enough proof of the quality, however with some small details that seriously need to be taken care off, in order for this product to excell. This Review article is still under construction till all texts are duly prepared. 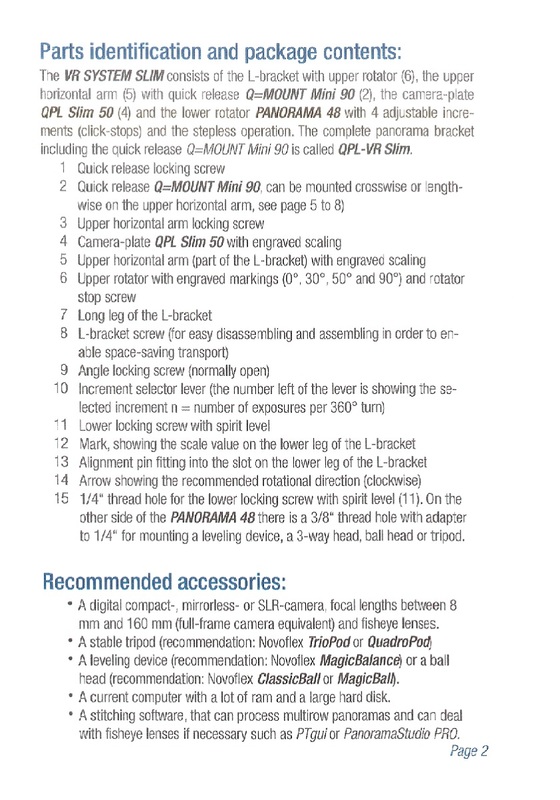 In the meantime the article stands as a reference page and photo guide to the innovative Novflex VR-System Slim Panorama head. The Novoflex VR-System Slim Panorama Head came in a plain white hard-carton box with stickers depicting the model included, with description in German and English. First thing that meets the eye when opening the box is the quite thick, A5 size, colour manual on top of the black foam which fills the box. The thick pre-cut foam protects the Aluminium VR-head and its components from impact during transport, while it can remain a good storage place. The head travels folded, snugly fit into the foam, with only a few add-on parts contained in different pockets of the thick foam. The Panorama Head is pre-assembled so the user is not required to have any knowledge or tools in order to make it work. 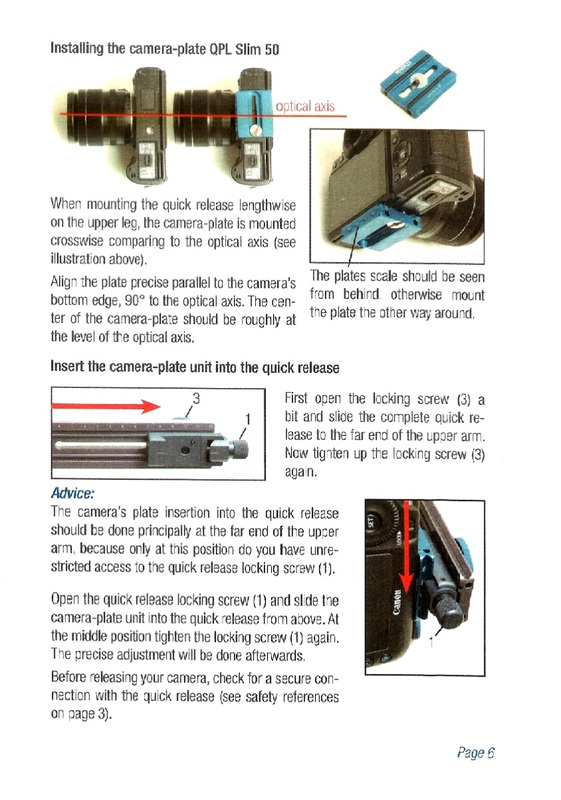 As mentioned above, only the Slim quick release plate and the hot-shoe bubble level are found in different pockets. Nonetheless, a couple of Allen hex keys and a small 1/4"-20 stud are enclosed in a zip-lock nylon bag. The VR-System Slim is accompanied by a 20 page colour manual in English (at least my copy was in English, while I suspect that the manual language is determined by the country the product is shipped to). This manual was above expectation in any respect. 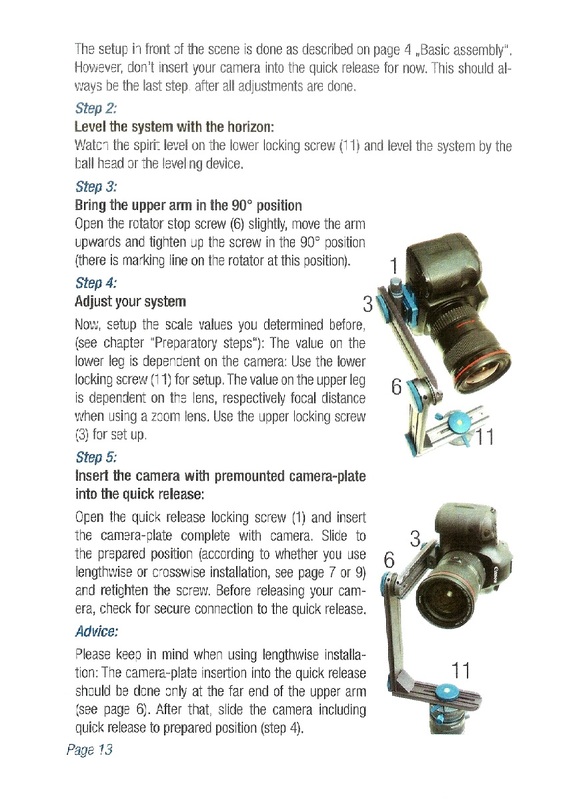 Very comprehensive and detailed, starting with description of the components, continuing with setup instructions of the VR-head, instructions of camera and lens adjustments, click stop settings for different focal lengths and so on. 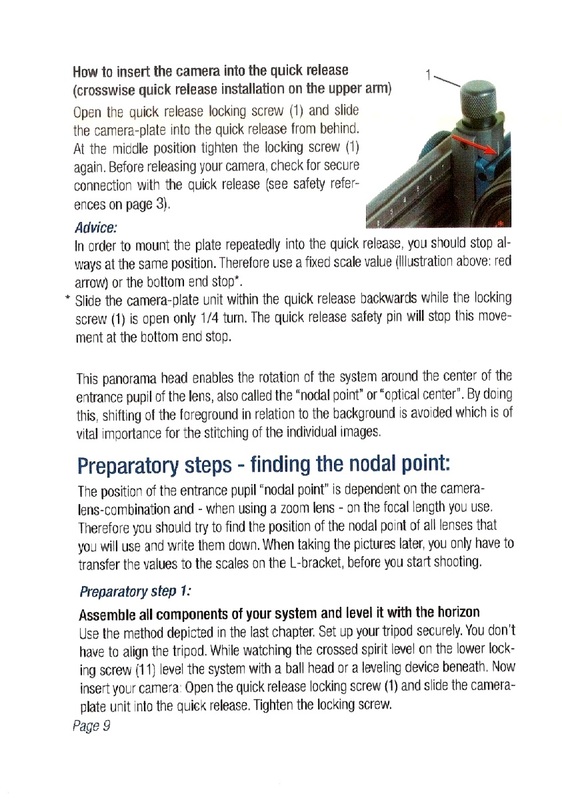 There is even a tutorial included, on how to determine the Non Parallax Point (Nodal Point) of a lens as well as tips for better panorama stitching. Excellent work. You may click on any of the above digitized pages for an enlarged view for reference. 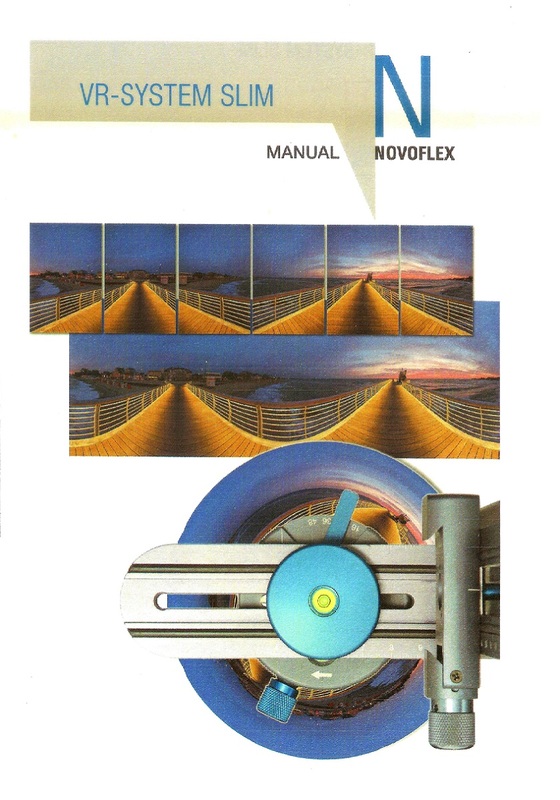 Please note that the manual and its pages are © Copyright of NOVOFLEX Präzisionstechnik GmbH. Focal lengths between 8 mm and 160 mm (35 mm FF Equivalent) or Fisheye Lenses. Stitching Software that can process multirow panoramas and can deal with fisheye lenses. The VR-System Slim Structure is based on three Arca-compatible rails anodized in grey color, held together by four large diameter thumb screws anodized in the Novoflex standard metallic blue color. Unlike previous Novoflex Panorama heads which used Q-mount QR clamps the VR-System Slim design, borrows elements from other well known compact panorama heads regarding the attachment of its parts, via large diameter thumb screws. The horizontal rail is screwed on the base rotator with a large thumb screw which features a bubble level in the middle. The upper vertical rotator is a integral part of the vertical and nodal rails held together by another thumb screw. Although I have no further information at the moment for possible stepless rotation or alternative options about the vertical rotation axis, the click stops at 10° increments are not so convenient in my opinion. A very usual angle of 45° cannot be attained with this incrementation. Where the VR-System Slim differs from most compact panorama heads in the market is the utilization of a relocatable and reorientable Q-mount Arca-compatible quick release clamp instead of a screw on camera plate. Or to phrase it differently, the VR-System Slim shown in its primal component state, or even better how to turn the Panorama head into bits and pieces. Novoflex VR-System Slim Panorama Head individual components and parts on the bench. Starting from top left, we can see the large blue thumb screw with stop screw (more on the subject of stop screws later on) which holds together the vertical rail, upper arm (rail), a couple of Allen Hex keys, the dual bubble level sitting on the vertical rail, the QPL Slim camera plate, another large blue thumb screw with stop screw which controls and tightens the mini Q-Mount (clamp) to its right. Just under it the Panorama 48 plate (rotator) with its pan lock screw, 1/4"-20 bushing, mounting stud and anti-twist stud. And finally on the last row, the large blue thumb wheel screw (without set screw), which holds the vertical rail structure on the horizontal rail with its right angle block, as well as the large blue thumb screw (without set screw but with bubble level -not shown) which mounts the whole structure on the P 48 rotator. Further down we shall examine each component separately and its role in the structure of the head in order to have a better idea of how it all comes together as a concept and how the concept is actually implemented. The Hot-Shoe bubble level included with the VR-System Slim is a long term companion to the Novoflex VR Pro Panorama heads and shows the attention to detail payed by the Noveflex team. 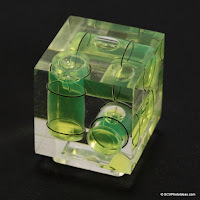 It is of good quality clear Acrylic containing two bubble levels positioned perpendicularly to each other. Combined with two mounting shoes, it can have a dual function i.e. 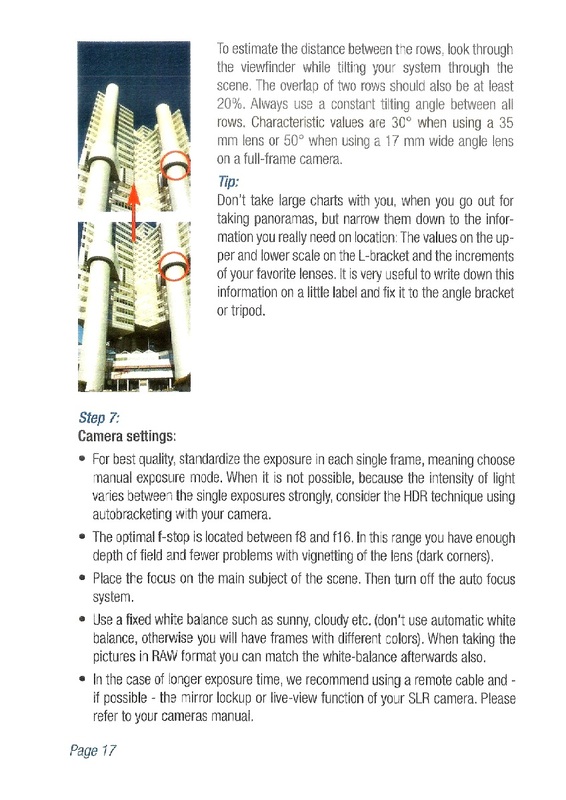 when inserted into the flash hot-shoe of a camera, it can show level either in landscape (horizontal) or portrait (vertical) orientation. 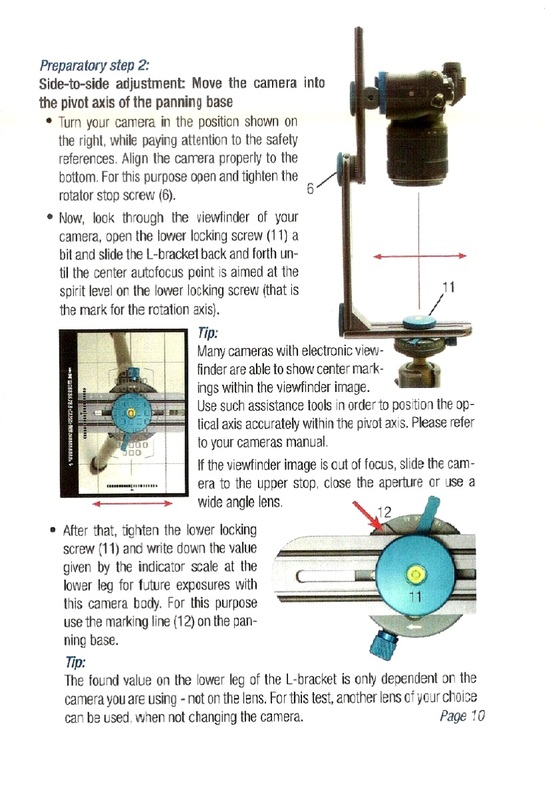 You may seek some more information about hot-shoe bubble levels in the relevant Hot Shoe 3-Axis Spirit / Bubble Level Reference. Since the VR-System Slim head is a small size Panorama head addressed to smaller size mirrorless or DSLR cameras, the included Arca-Swiss® compatible camera mounting plate is equally small. The QPL Slim 50 model name denotes the 50 mm length and the slim profile of the plate. Nonetheless, besides the slim nature the plate still features a double (top and bottom) dovetail. The finishing is superb with rounded edges and a satin Royal-Blue anodizing. All laser engravings of the brand and model names are in white. Following the Novoflex® customs the top surface has two channels parallel to the mounting screw captive slot, which are filled with rubber rods as an anti-twist measure. The 1/4"-20 camera mounting screw is held by a plastic Circlip within the limits of the captive slot, not allowing it to fall through the larger opening on one side. This is a quite common solution for Novoflex's own and other plates, that are to slim to have a threaded opening for the captive mounting screw. The underside (bottom) of the plate reveals the captive slot and wider groove, which allows the slotted but also hex socket head mounting screw, to be laterally adjusted. Due to the thin profile of the plate, Novoflex® engineers have wisely engraved a decimal scale under the top dovetail which will allow it to remain visible after the plate is mounted on a camera as we shall see further down. The decimal scale is marked with small lines every 5 mm and digits every 10 mm starting from the very edge of the plate. The quite large ~40 mm in diameter Thumb Screw Wheel Knobs are anodized in the same satin Royal-Blue color and feature a diamond pattern on the perimeter for better grip. In order to avoid abrasion when in direct contact with the surface of the rails all of them feature a Mica washer, which also helps to avoid sticking when fully tightened. All four Thumb screw knobs have an 1/4"-20 thread on the tip of their long stem, and except for the one with the embedded bubble level that mounts the head on the P 48 rotator, the other are also tapped in their stem. Two of the knobs, the one which takes care of tightening the upper rotator and the the one tightening the Q mount (QR clamp) are captive. This is accomplished by a small screw that goes into the stem hole. Quite a clever way to make them captive. We shall see more about the functionality of the knobs further down discussing each connection independently. The Q mount clamp is quite narrow with small jaws which both have center index marks for the proper alignment of camera plates or rails. A spring loaded safety pin is located just beside the center hole. This safety pin prevents Novoflex plates or rails from falling in case the clamp is not tightly closed. The pin will work also with other makes of plates or rails as long as there is a recess at the bottom with no opening on the ends. The bottom side of the clamp has small square projection around the center hole that allows it to align both longitudinally and perpendicularly with a recess along the horizontal arm, acting as well as an anti-twist measure when the Q mount clamp is tightened by the thumb screw on the rail. Small alignment lines are present at both sides fr alignment with the scales on the horizontal arm, when the Q moount clamp is set longitudinally on the rail. Somehow, I couldn't find any alignment lines for when the Q mount clamp is set perpendicularly on the horizontal rail. The design of the moving jaw of the Q-Mount QR clamp is quite unique met only on Novoflex® quick release clamps. Most Novoflex QR clamps (see Novoflex Panorama=Q 6/8 II Plate Review ) use a narrower moving jaw that uses the side walls as a guide instead of tongues and pockets found on most other designs. This of course requires a high-end fitting with minimal tolerances. However, the small dimensions of the Q-Mount clamp found in the VR-System slim head do not allow for the appropriate shaping for up-down and lateral alignment, so a couple of small screws on the sides take care of the alignment and anti-twisting of the moving jaw. 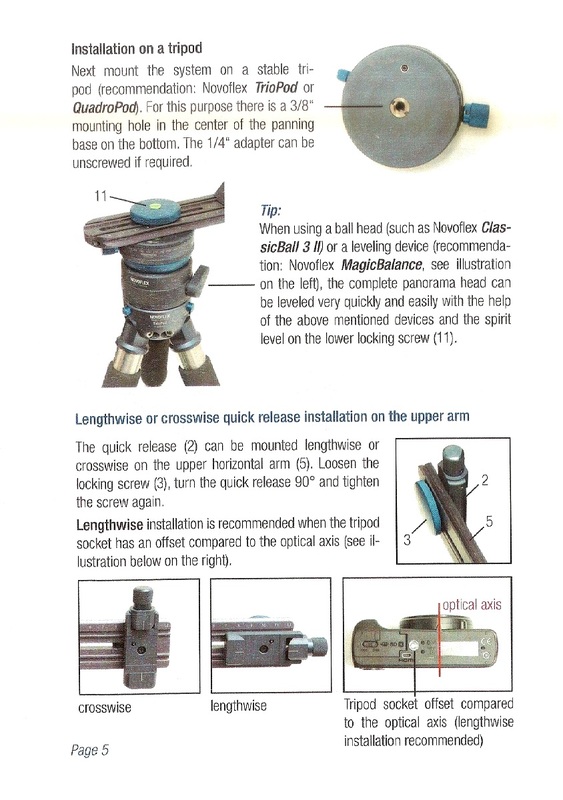 A closer look at the photo bellow shows that the screw thread pitch is very wide, thus allowing the clamp jaw to open and close with little effort. Only half a rotation of the screw knob is enough to open and close the jaw. However, although fast action is appreciated, matching the speed of a lever release, the coarse thread was not found so secure in locking the clamp firmly. Further, the small size of the screw knob it is not so easy to tighten and keep it locked with this thread pitch. It is very easy to unlock the clamp and the clamped plate to slide out of adjustment. Thanks to the safety pin at least it does not fall off. Considering the vertical use of the clamp when holding a camera on the horizontal (nodal) arm, I guess we have an issue here on which I shall come back later on with details. Novoflex VR-System Slim Q mount clamp views, showing details of the moving jaw design as well as the bottom mounting hole with alignment rectangle (bottom left) and front threaded hole (bottom right). Since I had the same experience with Panorama=Q 6/8 II Plate Q-Mount, reviewed at the same period, I suppose this is not a specific issue with this small clamp. Therefore, as mentioned there as well, I feel that Novoflex should change the lead screw pitch sacrificing a little clamping speed in the name of safety. Novoflex, as an early adopter of the Arca-Swiss® dovetail system, besides the QPL Slim 50 Plate included in the package, has a complete range of universal camera and lens plates which cover almost any need. 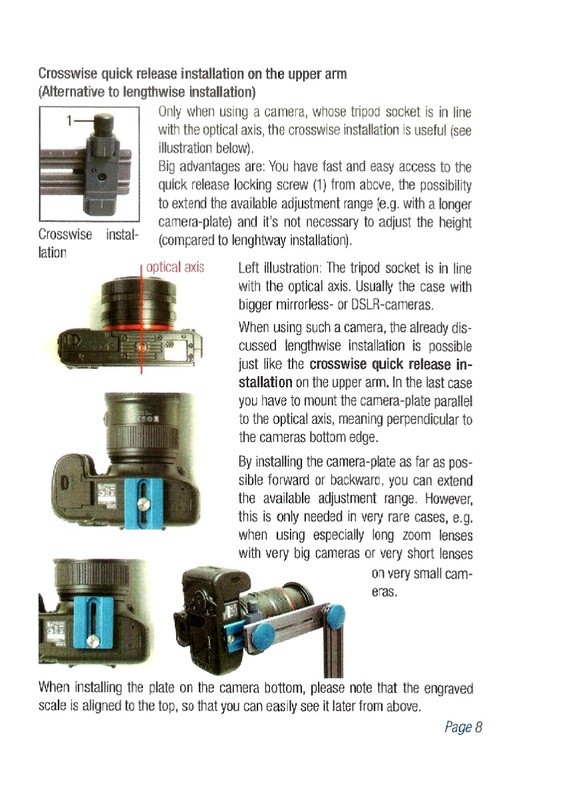 Nonetheless, the Q Mount quick release clamp matches seamlessly with Novoflex's own QPL Slim 50 illustrated above. Obviously the clamp jaws have a perfect contact with the lower dovetail of the QR plate. The Q Mount quick release clamp matches seamlessly with Novoflex's own QPL Slim 50 illustrated above. As usual, since there are a lot other makes of Arca style dovetails, the Q mount compatibility was verified. It was tested with various camera plates, lens plates and multipurpose long rails of various thicknesses and widths. Plates and rails tested were from Benro®, Desmond®, Hejnar PHOTO®, Kiwi Fotos® and Sunwayfoto®, with excellent clamping in general. The Q mount clamp is shown above with a Hejnar G10 series 1/2" rail which by the way is fully RRS® compatible. Consequently the Q mount clamp is shown above with a Hejnar G10 series 1/2" rail which by the way is fully RRS® compatible. Due to the slightly different dovetail edge the contact area between the Q mount jaws and the rail is a lesser but still adequate to hold the long rail in place securely. However, the Q mount is not compatible with any M3 safety stop screws under the rails, since there are no relevant relief grooves present. Another point that may be an issue are the cross braces below many long rails, which may hit on the safety pin of the Q mount prohibiting free movement from end to end within the clamp. For the readers that like numbers, detailed measurements of the clamp Jaw dimensions are quoted below, so as anyone can decide whether this clamp is compatible with the dimensions of his/her plates or rails. Although it really is a very slim clamp all dimensions fall within the average limits, consisting the quick release clamp compatible with almost any Arca-Swiss® type plate and/or rail. The VR_System Slim is based on a member of Novoflex's also new and improved "Panorama Plates family" the Panorama 48. 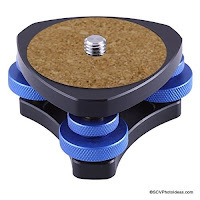 It is one of the smallest and lightest panorama indexed panning bases with four (4) integrated click stops you can find around at this moment. But despite the small size and weight, the most innovative feature on most members of the new series is the easy selection between the click stop increments by a small lever on the top platform. No plungers, Allen keys or detent disk exchanges. The Panorama 48 sports an 1/4"-20 stud on top paired with an alignment / anti-twist pin which both enter into the long slot of the horizontal rail of the VR-System Slim head. The panning base is then locked in place by a large blue thumb screw. The bottom mounting hole is threaded 3/8"-16 but comes with a metal bushing for conversion to 1/4"-20 thread. For those interested in a compact indexed horizontal rotator, the Panorma 48 is also sold separately. The small shiny blue knurled knob is called "Angle Locking Screw" by Novoflex in the part naming table of the accompanying manual. Nevertheless, it is the one responsible for locking the panning base of the rotator unless when using the click stop options where the panning lock knob should be and remain loosened. Excessive screw tightening is avoided since it is buffered by a rubber O-ring, shown above with the knob removed. Somehow this means that the knob is Non-captive and if unscrewed inappropriately too much may fall off in the field. Somehow, at Novoflex look at the matter under a different perspective. 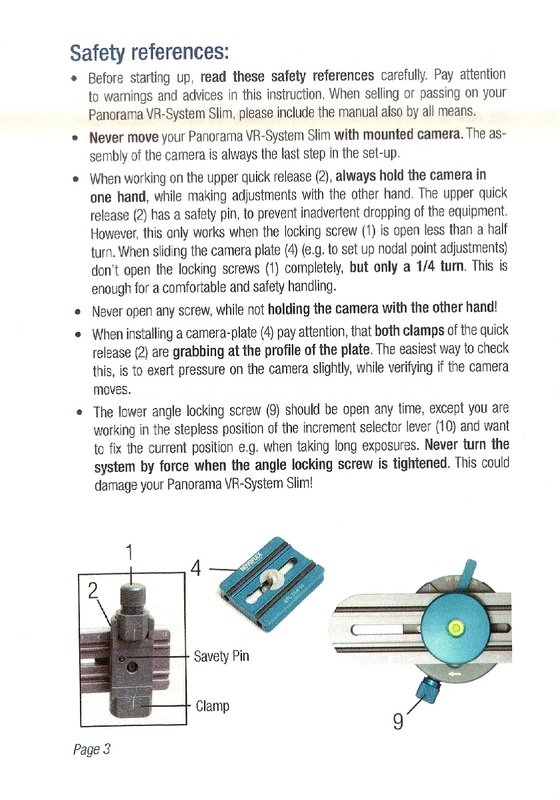 They suggest that as long as the indexing feature of the Panorama Plate is utilized, the panning lock knob is redundant. Therefore, by being removable is actually a benefit, since when removed the footprint of the rotator is further minimized for nadir shots. As mentioned previously in the P 48 Plate description, a blue color Aluminium lever is responsible for the selection of the stops around. The white arrow on the lever plays the role of an index showing the laser mark on its left. Obviously the "0" mark for stepless motion is missing being denoted that it is selected when the lever resides on top of the "16" stop mark. The detent increments are set at (16) 22,5°, (30) 12°, (36) 10° and (48) 7,5° as well as 0 for stepless rotation, which can cover a wide range of lenses. The choice of click stops may seem too narrow for wide angle lenses but wider angles can be set by multiples of the pre-set click stops. For example you can have 8 stops every 45° by setting the lever on (16) 22,5° and count every 2 stops and so on. Somehow, this may cause frustration to some panographers who follow a specific workflow but may also prove convenient for others. Nevertheless, besides the predetermined intervals on the Panorama 48 panning base the user can count on every second, third, fourth or even fifth "click stop" in order to expand the selections. 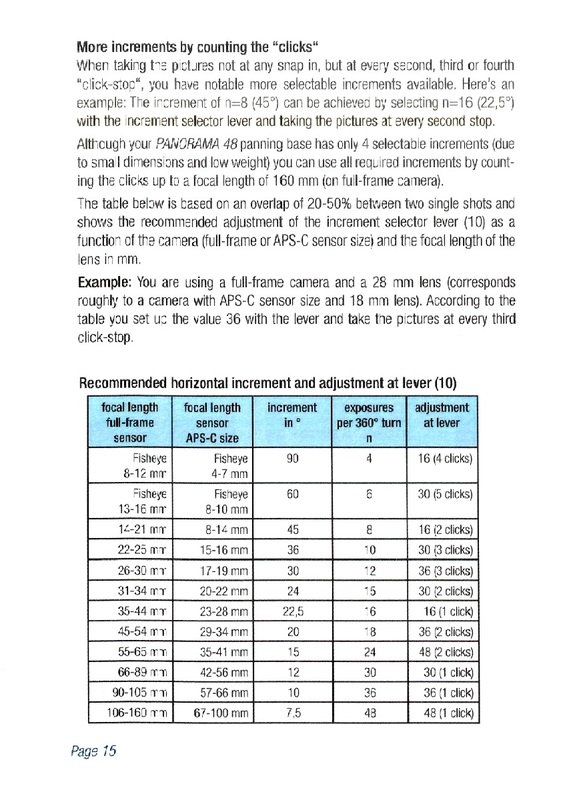 The following table is built according to the Novoflex manual taking into account a 20-50% overlap between two shots and shows the recommended position of the increment adjustment lever, taking into account the sensor size (FF vs APS-C) and the focal length of the lens to be used. Main and very obvious difference between the Panorama 48 and Panorama=Q 6/8 II is the Q Mount QR clamp of course. Otherwise, all internal mechanisms are exactly the same but for the lower three detent interval options with fewer click-stops, which actually make the 6/8 II Plate (Rotator) more appropriate and easier to use for applications utilizing wider focal lengths. Novoflex Panorama=Q 6/8 II Plate on the left and Panorama 48 Plate on the right. Due to the lack of the QR clamp on top of the P 48 Plate, the digits marking the detent interval stops are placed within the selection lever cavity. A fact that may confuse a user comparing the two panoramic rotators, at first. As explained previously, although no "0" mark is shown continues movement is possible when the lever is on the leftmost position covering the "16" mark. In this respect P=Q 6/8 II is more clear as each lever position is marked with the appropriate number of stops on top. 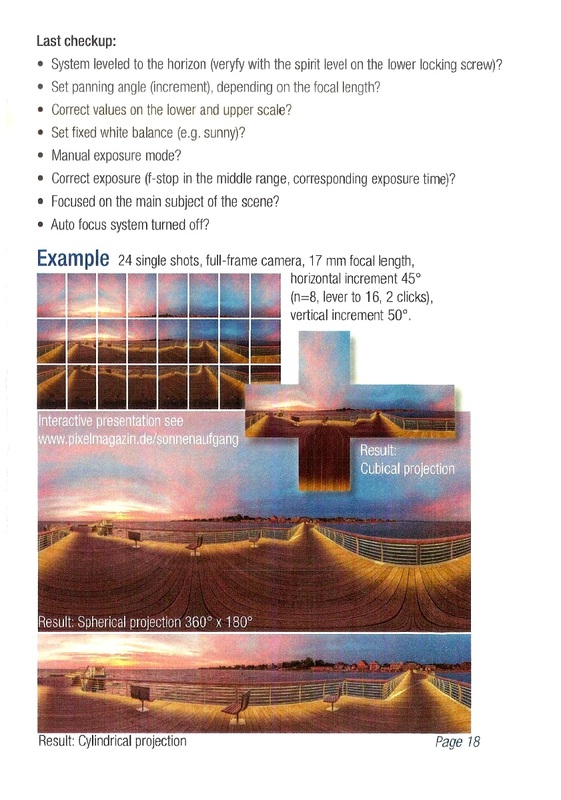 The table below shows a comparison of Novoflex Panorama=Q 6/8 II Plate Indexing Rotator with Panoramic Indexing Rotators of similar characteristics coming from other manufacturers. Platform ∅: 62 mm /2.44" 62 mm /2.44" 64 mm /2.52" 64 mm /2.52" 35 mm /1.38"
Base ∅: 62 mm /2.44" 62 mm /2.44" 64 mm /2.52" 64 mm /2.52" 41 mm /1.61"
Height: 30 mm /1.18" 18 mm /0.70" 25.8 mm /1.01" 27 mm /1.06" 41 mm /1.61"
**Convertible via bushing or addition of Quick Release Clamp. 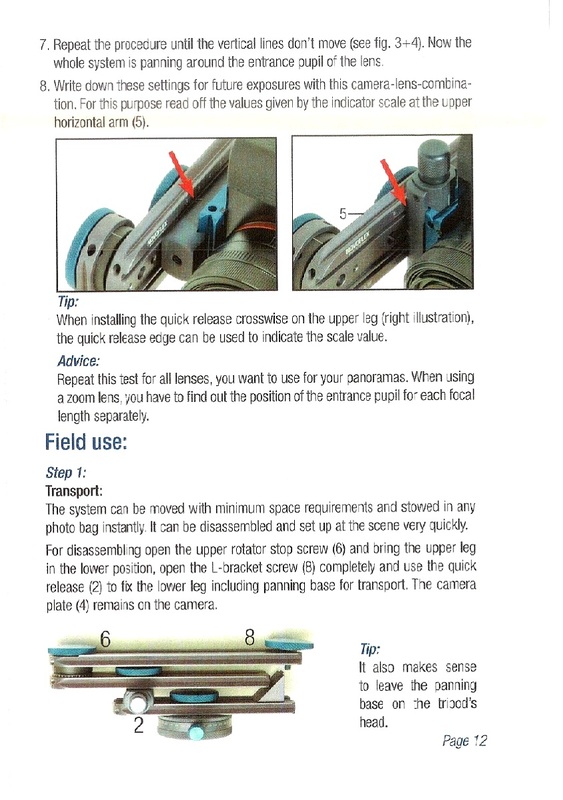 Mounting of the Novoflex Panorama 48 directly on a tripod equipped with a 3/8"-16 stud, requires removal of the pre-installed 3/8"-16 to 1/4"-20 bushing, mentioned previously. Direct mounting on a tripod top mounting plate, just needs screwing the Panorama 48 onto the tripod stud and then secure it either by tightening the set screw on the tripod top plate (if it exists) or by tightening the Immersible anti-twist pin on the Panorama 48 mentioned previously. Although not many Panographers are fond of leveling bases, others prefer to level their panoramic gear using a leveling base. In this case the leveling base of your choice is mounted first, followed by the attachment of the Panorama 48 Plate on top of the leveling base naturally. 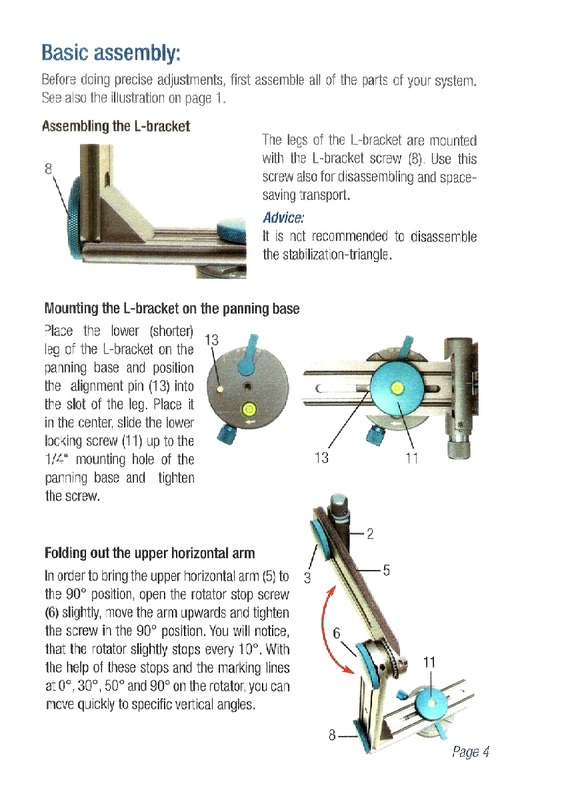 Mounting and securing sequence of the Novoflex Panorama 48 rotator on a leveling base. A small sized SONY NEX-7 ILC camera was in my hands testing the the excellent SONY 16mm f2.8 ultra wide lens, during the Novoflex VR-System Slim evaluation period. A welcomed coincidence so as to have the chance to see how it fit on the head which is designed for smaller cameras. 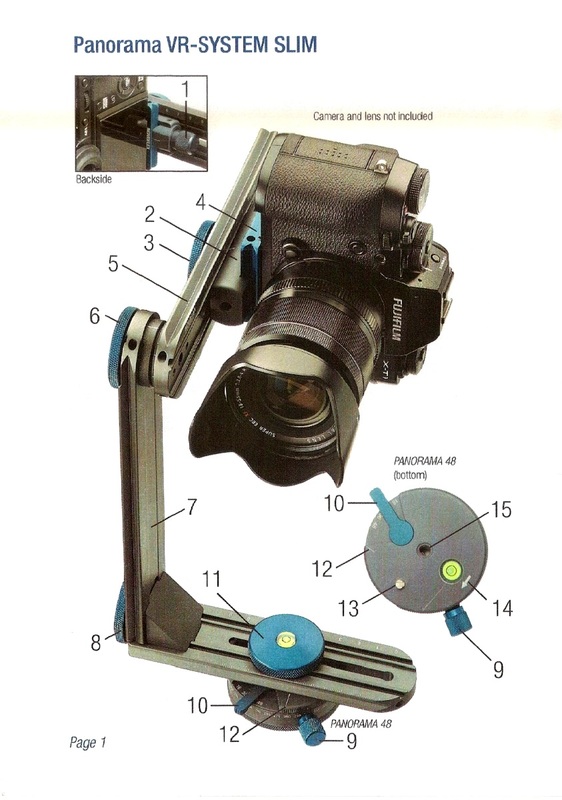 Mounting a Sony NEX 7 ILC longitudinally on the horizontal arm via the Q Mount requires placement of the Q mount perpendicularly to the horizontal arm. Sony NEX 7 ILC mounted longitudinally on the horizontal arm via the Q Mount. Since Sony NEX-7 is an APS-C camera the crop factor of 1.5 has to be calculated on the 16 mm focal length to determine the frames required. This is 24 mm in 35mm equivalent and requires 10 frames every 36° in 3 rows at -45°, 0° and +45°, plus a Zenith at +90° and a Nadir shot at -90°. 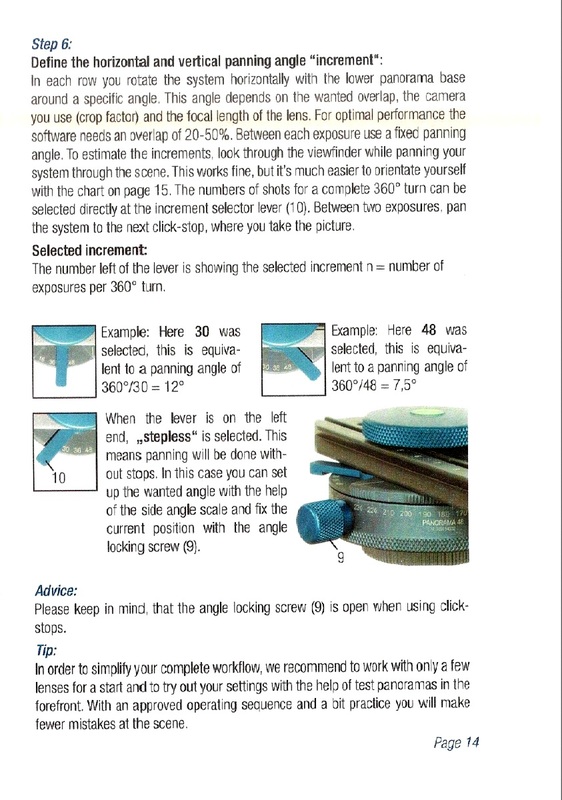 Nonetheless, as discussed earlier Panorama 48 does not have a choice for 10 click stops therefore its lever has to be set on 30 click stops and the user count every three clicks of 12° to get the 36° required. Somehow, also the vertical tilt increments every 10° do not seem to meet the requirements for this lens for proper overlapping between the rows. In this case, instead of 45° tilt up or down to divide the rows equally, we need to go either at +/-40° or +/-50° increasing or decreasing the degrees of the overlapping between the rows or the zenith and nadir area. Setting the horizontal arm rotator at +50° as +45° is impossible. Setting the Vertical arm rotator at -50° as -45° is impossible. 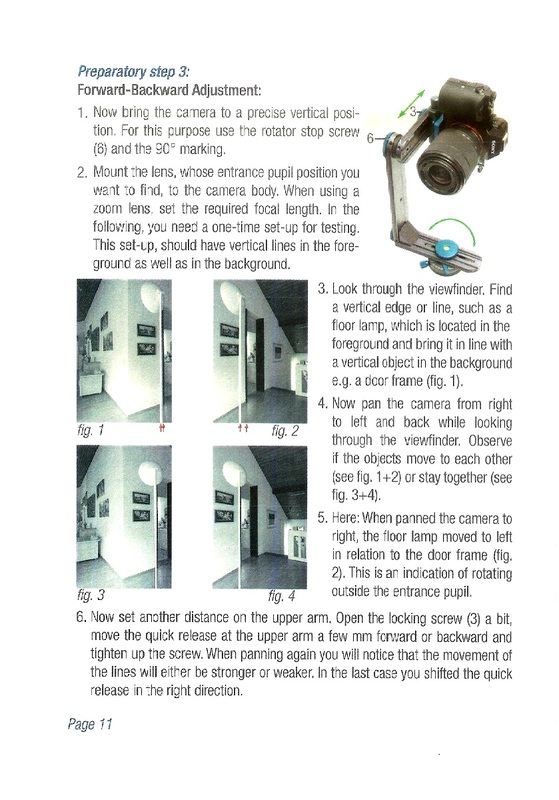 Setting the Horizontal arm parallel to the Vertical arm at +90° to shoot a Zenith frame. Set at +90° for the Zenith frame. Setting the Horizontal arm rotator at -90° perpendicular to the ground to shoot a Nadir frame. Set at -90° perpendicular to the ground for the Nadir frame. Mounting a Canon EOS 550D on the horizontal arm via Q Mount requires now longitudinal placement of the Q mount on the horizontal arm. 6 frames every 30° one rows at -15°, plus a double Zenith at +60° opposed. Setting Panoram 48 lever at 30 counting every 5 clicks. 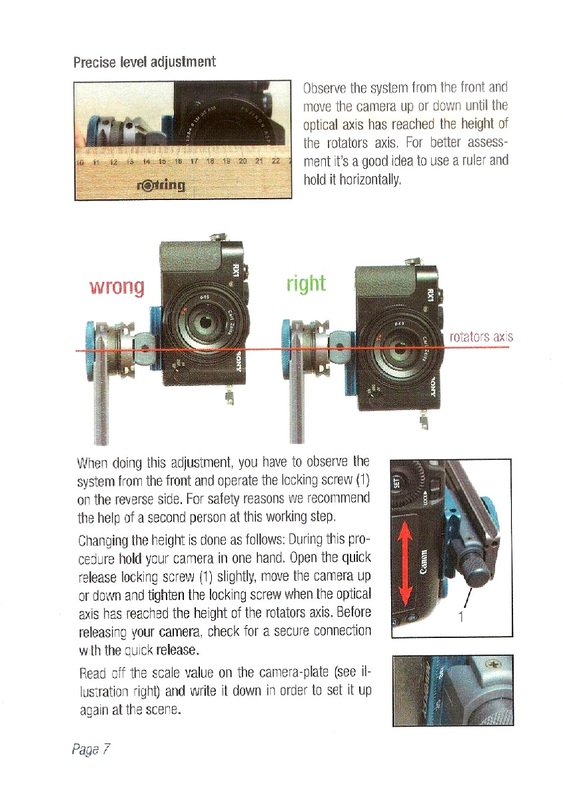 Setting the horizontal arm rotator at +60° for two opposing zenith frames. Mounting a Canon EOS 7D on the horizontal arm via Q Mount similarly requires longitudinal placement of the Q mount on the horizontal arm. 12 frames every 30° in 3 rows at -45°, 0° and +45°, plus a Zenith at +90° and a Nadir shot at -90°. Setting the Horizontal arm parallel to the Vertical arm at +90° we can shoot a Zenith frame. style="text-align: center;">Setting the Horizontal arm rotator at -90° perpendicular to the ground we can shoot a Nadir frame. Mounting a Canon EOS 550D with BG-E8 Battery Grip, on the horizontal arm via Q Mount requires once again longitudinal placement of the Q mount on the horizontal arm. In order to accommodate the extra distance from the vertical rail, the Novoflex VR-System Slim Horizontal rail requires opposite placement on the Panorama 48 exploiting its full length. In spite the superb quality, there were some issues that couldn't be left unnoticed. It has to do with rigidity and stability of the vertical arm. In my opinion these issues can easily be fixed by some minor changes in the design of the vertical arm mounting mechanism, but not by the end user. First issue encountered was a small inward tilt of the vertical arm under load, which results in a misalignment between the base bubble level and the Dual Hot-Shoe bubble level. 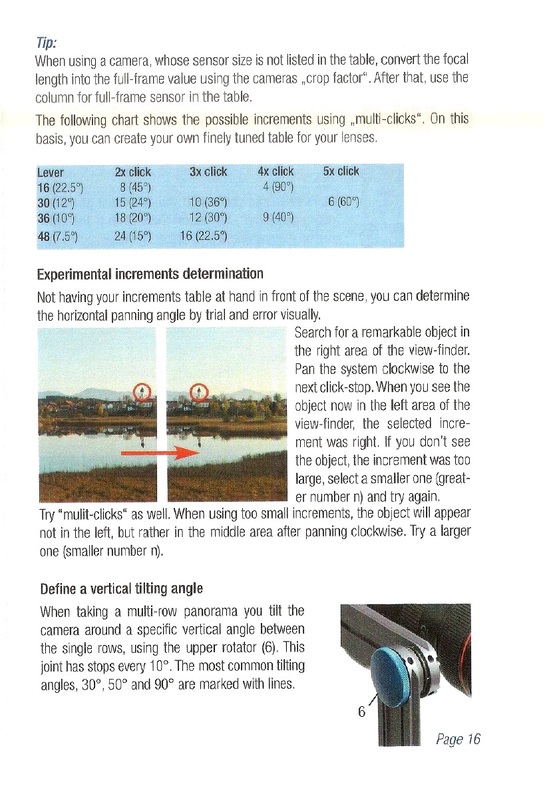 No matter how much the thumb screw of the vertical arm is tightened there will be some tilt if a camera is set at the maximum offset as shown below. If you align either bubble level reading it will result in tilted pivoting. Some 1-2° tilt backwards also exists when a larger or heavier camera is hang way back on the horizontal arm. Once again, tightening the vertical arm thumb screw on the right-angle block of the horizontal rail cannot immobilize the vertical rail. The alignment channel on the vertical rail is quite shallow to keep the rail from twisting back and forth under even little pressure. Novoflex VR-System Slim Vertical rail wiggles back-forth when forced by hand due to some minor fitting tolerances between the vertical rail and the 90° block support. My suggestion is about an alternative fitting of the Novoflex VR-System Slim Vertical rail, which requires the 90° block support to be permanently attached on the vertical rail and the thumb screw to be inserted from below under the horizontal rail. This position,most probably will eliminate the back-forth wiggle and with a slight increase in the projected part of the 90° block will avoid twisting instead. Novoflex VR-System Slim Vertical rail alternative fitting suggestion. Further, to the more firm attachment between the vertical and horizontal rails, the above mentioned improvement would also allow for an easier 180° turn of the vertical rail outwards, in order to enable a Nadir shooting unobstructed by the head and the tripod legs. The system can be collapsed very quickly by loosening two thumb screws and unscrewing one; thus stowed away in any photo bag. In more detail, it only requires to unscrew the vertical rail - horizontal arm assembly from the base horizontal rail, loosen and fold the horizontal arm and clamp it all together on the horizontal rail by the mini Q-mount (clamp). A little centering of the horizontal rail and you are ready to pack. As the VR_System Slim Panorama Head does not come with any carrying case or protective bag, I can suggest a Neoprene Pouch that I comes very handy in size to hold the whole head. It is the XL Size of Matin Neoprene pouches, which can prove useful in preventing your Panorama Head getting scratched by other apparatus in your bag, or nonetheless scratch other apparatus. Novoflex VR-System Slim Panorama Head packed in Matin Neoprene Lens Pouch XL. Exceptional machining, finishing, and build quality. Very smooth panning operation with very well defined detent click stops. Full range of tools and accessories included. Very good value for money ratio. Easily marked or scratched matte anodizing. Vertical rail fitting allows for minor play back-forth. Alignment pin on P 48 Panorama Plate is not wide enough to immobilize the horizontal rail. The start points of the numbering of the Engraved Scales is not relevant to the pivoting points. Q-mount clamp does not tighten firmly due to wide pitch of screw thread on screw knob. Q-mount clamp does not have alignment marks for perpendicular mounting. This review and test was run on a single product sample, using the specifically described methods. Independent of the favorable or unfavorable results of any test, a test on a single product can not be used as a rule, unless more samples of the same product are tested. Furthermore, similar comparison tests should be run with comparative capabilities products so as to reach a solid conclusion. Note: The Novoflex VR-System Slim Panorama Head presented in this article was kindly offered by NOVOFLEX Präzisionstechnik GmbH for evaluation and review. The Panorama Plate 48 is independently available for EUR 185.00 from Amazon and from eBay worldwide.